There are 4 reviews of Whispered Myths. Wow, got WM in a sample pack awhile back, and now I’m not sure if I ever tried it?!? Found it in the drawer today and used a good amount...and glad I did! It’s real, quality, Oud! It’s easier for me to decipher between real and fake Ouds since I’ve been purchasing a few real Oud oils lately. The cedar and honey aspect really balance out the medical sharp edges of the Oud. FB worthy imo! Oud isn't my jam, but even I stood to attention. Well done, incredible longevity, easy on the nose, a much softer and woodier oud. The cantaloupe and honey notes really help to smooth this one out too. Brought this sample into work for the guys to try out (and I'm a gal) and it was quickly snatched up, very much loved by others in the office. I stumble with describing this one because oud is new in my own repertoire of scents and I don't have a good frame of reference. Great longevity, it lasted close to 9 hours on my skin. One of the recent releases by Josh Meyer of Imaginary Authors, done semi-secretly on the website and by word of mouth, is Whispered Myths, no doubt promoted substantially less than the release that followed it, "O, Unknown!". Whispered Myths marks the first occasion in Imaginary Authors of oud being a prominent, and in this case, a dominant one. The oud used in Whispered Myths is seemingly neither toward the animalic nor soberly smooth extremes of what oud can be, resting somewhere in between. And in that respect, it seems to both a nod to true oud-lovers as well as a movement toward the middle as far as ease-of-wearing. Even at first smell, it's one of the easiest oud fragrances to wear that I've smelled, and one need not be a fan of rose (as in the many rose/oud combos) or another pronounced note to like the fragrance as a whole. 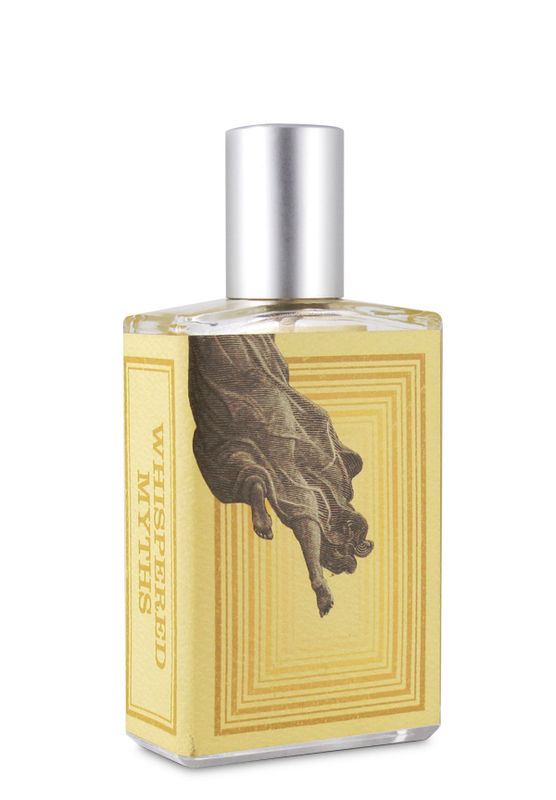 The other contributory notes, minor players by comparison, of cantaloupe, cedar, and honey, sweeten and smooth out the oud further, harmonious making it even more wearable. It's sweet and enjoyable while still being bold and oud-intensive. Performance is quite great, stronger than average in terms of both projection and longevity, albeit not quite the beast of some of its Imaginary Authors siblings, such as A City on Fire, Cape Heartache, and Memoirs of a Trespasser. Higher than the usual pricing (of $95 for 50ml), Whispered Myths is priced at $120 for 50ml, due likely to the cost of oud, I imagined, and this was confirmed by Gents Scents on YouTube. There are no member images of Whispered Myths yet. Why not be the first?